BusyCal supports a variety of event types, including banners, to dos, stickies, and journals. Banner — An all-day event that can span multiple days, appears above all timed events. To create a new banner, choose File > New Banner, press ⌘-B, or Control-click on a day and choose New Banner from the contextual menu. Event — An event with a start and end time. To create a new event, choose File > New Event, press ⌘-N, double-click on a day, Control-click on a day and choose New Event from the contextual menu, or click and drag in the Day or Week view. Dated To Do — A task with a due date that appears in the calendar and/or To Do List. To create a new to do, choose File > New To Do, press ⌘-K, or Control-click on a day and choose New To Do from the contextual menu. See To Dos for more information. Timed To Do — A task with a due date and time that appears in the calendar and/or To Do List. To create a new timed to do, choose File > New Timed To Do, press ⌘-Option-K, or Control-click on a day and choose New Timed To Do from the contextual menu. See To Dos for more information. Undated To Do — A task with no due date that appears only in the To Do List. To create a new undated to do, choose File > New Undated To Do, press ⌘-U, or Control-click in the To Do List sidebar and choose New Undated To Do from the contextual menu. See To Dos for more information. Sticky — A floating yellow sticky note attached to a date. To create a new sticky choose File > New Sticky, or press ⌘-Y. Journal — A Journal event is similar to an all-day event. It occurs on a date, but has no start or end time, and does not occupy any time in your calendar. Journal events can be useful for recording information that occurred on a specific date, such as the details of a discussion, a list of accomplishments, or a diary entry. Graphic — A floating graphic attached to a date. Graphics may also be attached to events. To add graphics, drag them onto the calendar from the Graphics Panel (choose Window > Graphics Panel). See Graphics for more information. You can drag a sticky by its title bar. To delete a sticky, click in the title bar to select it, then press Delete. To minimize a sticky to the date header, click the “x” in its upper left corner. 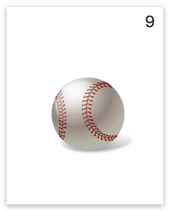 Hovering over a minimized sticky displays a magnifying glass, which expands the sticky to its full size when clicked. 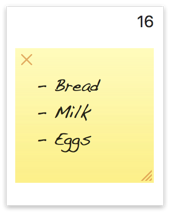 In general, Stickies are designed primarily as a decoration for the Month view and are not recommended in Day and Week view (unless minimized). 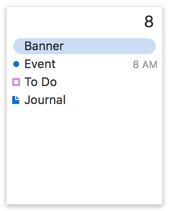 Note: Stickies, Journals, and Graphics in BusyCal sync between BusyCal clients through iCloud, but appear as all-day events (i.e., banners) in other clients. See iCloud Limitations for more information.